1.Set the Boot mode switch(A) for Nand Flash boot mode. 2. Insert the power adapter to the Power interface(D), Don't power on the board. 3. 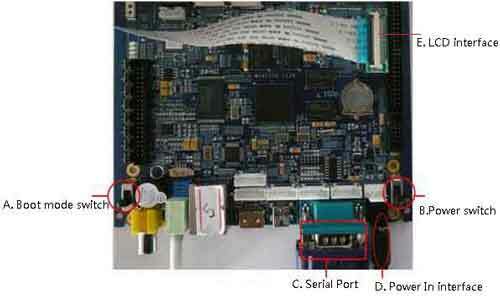 Using a serial cable, connect the Debug serial port(C) of the mini210s board to the Serial Port on your PC. 4. insert the LCD cable to the LCD interface(E). 5. Power on the board(B), you can enter the Android system default. 2) Click “Configuration -> Options”, it will open the “UART/USB Options” dialog. 4) Click 'Serial Port->connect' to enable the DNW serial link. Power on the board, then you can enter the Android system by the Hyperterminal on PC default. If you want to use the other system, you can burn the system to board as the follow chapter.